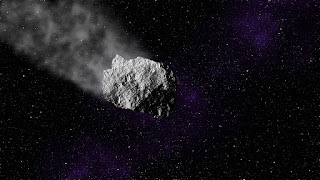 “There’s definitely something down there,” Lieutenant Send commented, his eyes fixed on his sensor displays as they had been for the past five minutes as the Tillerson cruised towards the large asteroid. “What is it?” Captain Danger asked. For all that this was an exceedingly dull mission, he could help but get just a little excited. “Do comets usually have very high metallic content?” Danger asked the science officer sat behind him. “Hmm.” Danger commented, tapping his fingers on his armrest. He needed a snack. “Distance to asteroid?” First Officer Konetkov asked. “Just over twelve thousand kilometres,” the helmsman replied. “Can we get a visual on the probe? On the viewscreen?” the captain asked. “I’m pinpointing the location and transferring to the main screen, sir.” Send answered. The screen, which had been showing a view of most of the asteroid, flickered and changed to show a particular bit of the asteroid. There was something there, sat on the surface, that definitely did not look like it belonged on a asteroid. “Can we compare that object to our database?” Danger asked. He was aware that he was asking a lot of questions today. It was almost as though he was out of his depth. “It’s far too big to be a probe, captain.” Landale said with the know-it-all demeanour of an Ohio State graduate. “So what is it?” Konetkov said, rising to her feet so she could stand closer to the screen. Everyone knew that she could do with glasses, or laser eye correction, but no one dared tell her. The words tumbled from Danger’s lips. “It’s a ship,” he uttered, the expression on his face making it look as though he was surprised at what he was saying. “It doesn’t look like any Earth Spacefleet ship, captain.” Lieutenant Send, objecting. Danger frowned at him - he could be annoying sometimes. Plus he was taller than him. “It’s not Earth Spacefleet,” the captain said. He turned to the engineering officer at the back of the bridge, who was trying to look busy. “Please confirm that all sensors are recording, and that internal ship cameras are recording. Earth Spacefleet Procedure Three Two Two is in effect.” he said, swiftly running his fingers through his hair in an attempt to comb the thick graying locks into place. He suddenly wished that he had had a shower that day. Danger growled, and prodded his control panel to bring up a list of Earth Spacefleet procedures. “Two Three Three!” he barked. Everyone on the bridge suddenly became very professional, and very sharp. It was down to Captain Anthony Danger of the Tillerson to speak the next, potentially historic words. He took a last drink of his cold coffee to clear his throat. Now live - The Journey: Part One!